I’m still sick. No more rides to report. But I wanted to revisit my fender problems. My front fender developed a crack on my ride to Tunkhannock, during a bumpy chipseal descent. These are Velo Orange 48mm fluted aluminum fenders that I bought in mid-August of last year and have about 2000 miles on them. The crack is where the fender attaches to the L bracket that joins it to the fork crown. Here are some photos of the damage. Whenever a piece of gear fails, it makes me think: was this a defective sample? Did I install it wrong or otherwise abuse it? Or is it an inferior product? In this case, I honestly don’t know. I installed the fenders with leather washers, although I realized when I removed the fender that I did not put leather washers on the underside of the two bolts above — only on the top of the fender, by the bracket. I do a lot of riding on gravel roads and a bit of trail riding on this bike, so maybe the fenders have sustained more vibration than normal. But I don’t think I used them in ways they weren’t intended to be used. I sent an e-mail to VO to see if they have any thoughts, and to find out if they are under warranty. My experience with these fenders has been mixed. They look fantastic, but I found them very difficult and time-consuming to install. I justified it by telling myself that they would last for many years. Now, even if VO replaces the front fender (which I doubt), I have lost a lot of confidence in them. I think aluminum may just be too brittle for this application. I’ve also noticed that my fenders show a lot of wear. I’m not someone who babies his bicycle. I ride on all kinds of surfaces, I lean my bike on the ground, or up against things, without thinking about it too much. And I sometimes carry my bicycle on a trunk rack on my car. All these things can cause some wear on a bicycle, and that includes the fenders. Fortunately, I don’t care if my bicycle looks pristine. However, this fender looks beat up enough for me to think that maybe they’re not rugged enough for my needs. Looking at the photo below, man, that left stay is bent. I’ll see what the folks at VO say, but I assume this damange won’t be covered under a warranty. I plan on getting some Planet Bike Cascadia or SKS P* fenders instead. I have SKSes on my old mountain bike-turned-commuter, and I’ve had a great experience with them. And I’ve heard a lot of good things about the Cascadias as well. I’m leaning toward them, mostly since they have built-in mud flaps. 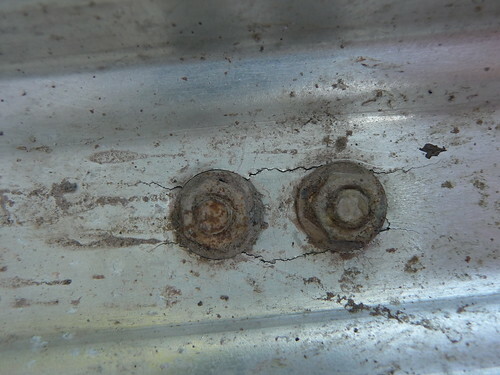 I have a rear Honjo that was mounted in a similar fashion… cracked in the very same way. 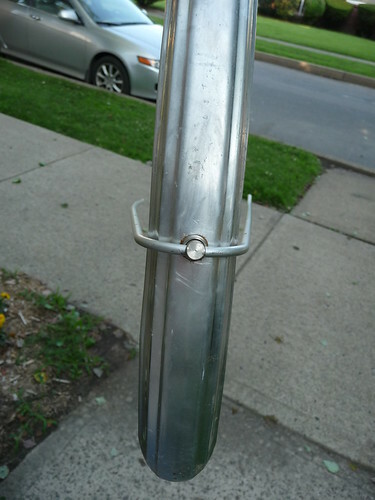 The flaw is in the design – 2 bolts, in line, close together. The fender flexes repeatedly about that point… and eventually they break. Especially if you ride on mixed surfaces – nothing to do but to flex and rattle and work that metal all day long. I switched to a the slide on clamp type for the rear Honjo and I use the fork daruma bolt for the front. Have not had an issue on the front… I’m pretty sure VO sells the spare parts. I have the Cascadia’s on my fixed gear all rounder. Like them well enough – but they are a bit short. If they made the fenders 6″ longer they would be perfect (I’m on a 700c CrossCheck). I also had a strange event with an aluminum fender too, with the rear brake bracket breaking =)…er…snapping during the course of a routine ride. I don’t do much of anything gnarly on the Bleriot, so for it to just ”snap’ was surprising. It took me a good while to order a new bracket given that it seems to have been a slightly irregular size. I know fenders do the trick (I guess), but I have several problems with them, especially with front tire overlap and with loosening hardware, again in the front. Good luck, but I have little wisdom for you. I always had the impression that aluminum fenders worked best for the “my bike is a showpiece crowd” and not high mileage riders. If you look at touring blogs, they almost always have the ESGE/SKS fenders. As for durability, I’ve noticed through comments that the Berthouds seem to be a bit heavier guage and hold up better. You can probably get a few more miles out of the VOs if you can cut out some reinforcement plates for either surface and sandwich them between washers and bolts. It may not look pretty, but will buy you some time. 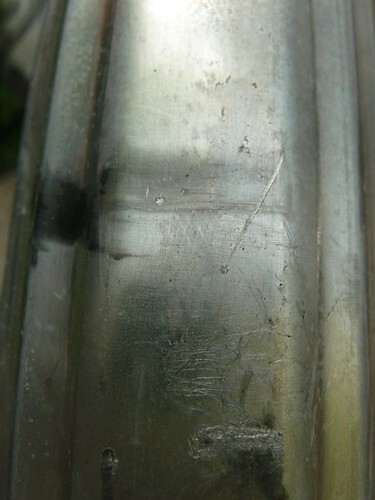 FWIW, I have had SKS fenders crack and tear apart at mounting points as well. I don’t know, doc, it seems like a lot of randonneurs use aluminum fenders. That leads me to believe that they can last a while, if everything is set up right. I should mention that I got an e-mail back from VO and my fenders are still under warranty. I will be sending in the cracked fender for a replacement. good point about the randonneurs. I’m glad to hear that VO is coming through. I’ve had limited business with them, but they always seem customer focused. I have similar feelings about the VO fenders I’ve used concerning durability. They are beautiful, and I’m a true sucker for beautiful bicycle parts, but wow my atlantis’s fenders are covered in dents and dings. In fact, the front one has been rattling around the daruma lately, and I wonder if I might not be having the same problem. Now that I’m in CA, I’m seeing another disadvantage to metal fenders. Since it rains for only a few months of the year, there’s not much reason to leave fenders on the bike during summer–especially when you have the desire to ride some fire roads and trails. We’ve pulled the fenders off emily’s saluki, and I think the atlantis will get similar treatment (and like some larger tires to take advantage of all that freed up space!) for the summer. Come winter, it will probably be time for SKS since plastic doesn’t dent! One huge advantage to metal fenders is that they follow the wheel so much better and lower, way less road spray. I guess I’ll just be making a mudflap for the plastic ones when that time comes. I just purchased the same VO aluminum 48mm fluted fenders and am planning on putting on my new Hillborne..when it arrives.. I have the fenders and all the hardware…( I do NOT have the leather washers )…so..certainly I’ll get some…or make some and use them everywhere..maybe even overkill..
but do you suggest anything else…like a piece of rubber or plastic sandwiched between the fender and the mounting bracket to distribute the load and stress?? or using the slide on bracket instead of the seat stay bridge fender tap? etc…. I had some aluminum Bluemels, vintage from way back but I’d say with aluminum you have to take great care, they buckled one time. Bikes get treated rough for the most part. V-O makes some stainless steel ones, that might be the way to go. I bought some of the VO aluminum fenders too and can attest to their lack of durability. On my first long ride with them a stick got caught between my rear fender and wheel and crushed it like a beercan. VO told me I’m SOL. I’ll be going with plastic fenders from now on as well. I have never used VO fenders, so I can’t attest to their durability. However, I can certainly vouch for VO’s customer service. One time, I expressed dissatisfaction with my order and they were extraordinarily proactive in fixing the problem. 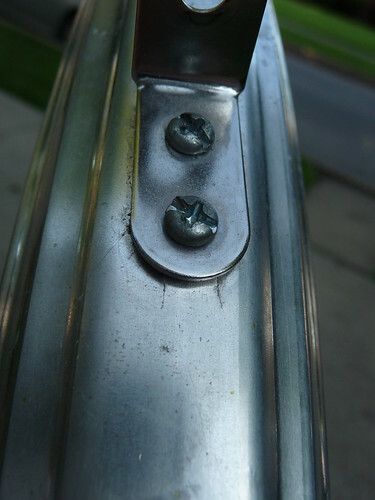 The back of the L bracket should be reinforced with a chrome plated steel plate – the small plate and the L bracket sandwitch the fender, then bolt them together if you know what I mean. I remember Honjo fender are fixed this way and from my experience living in Japan over 20 years, all the touring bike fenders are fixed this way. This is because aluminum is not as strong and steel fender or as flexible as plastic. If the stress from vivration concentrate on where nuts holding the fender, it is just matter of time to have this crack. It is not to do with the quality of the fender itself, to do with how to distribute the stress by using the steel plate. It is a commonsense in Japan to use large flat washer (say about at least half inch and as big as possible!) or metal plate inside (tyre side) the alu fender when fixing with darma or any bolt. I have VO 700c Aluminum fender on my commuter commuting rough road include gravel path for a year but there has been no rattle so far. Also, I recommend to use thread lock (like a glue) to stop loosening the bolts & nuts at fender area. A very useful comment, thanks Yasu! I’ll take that into account next time I install a metal fender.